…or don’t do it at all. Actually, yeah. Don’t do it at all. Because some things just shouldn’t be done – period. And you know, with the advent of my admission to 9rules, it’s that timeÂ when IÂ relate Louis Vuitton-branded SUVs to blogging. So yes, I’m going there. You can learn a lot from Louis Vuitton SUVs. See, Louis Vuitton doesn’t make SUVs. Handbags, sure, but automobiles? Never. But sometimesÂ we just can’t help making the stencil, getting out the spray paint and rolling one of these babies out of the garage and parading it around for awhile. We think that patterns – yes, even styles, trends, you-name-it – applied to anything else is an instant signal that whatever lies underneath, too, deserves notoriety and respect. Louis Vuitton SUVs are just likeÂ disingenuous posts in blogging, name-dropping in networking. All I’m saying is, in all things, be the best you can be. But be the best *you* that you can be. Don’t be tracing stencil and don’t be comparing and copyingÂ color swatches with anyone else’s crap. Find out what you like. Sometimes people just think that because something gains notoriety or even respect in one arena, applying that principalÂ to anything else (or yourself) will do the same thing. I won’t lie – we all want notoriety and respect and the easiest, quickest way to get there. But – to what extent do you apply formulas to yourself as if you had all the business using them or pretending you came up with its proof to have people, after coming up close,Â disappointed that you didn’t have the brainpower or substance to back it up? That whole time you dedicated to copying could have been used honing your own skills the best way you know how. There’s nothing wrong with solid paint, y’see. 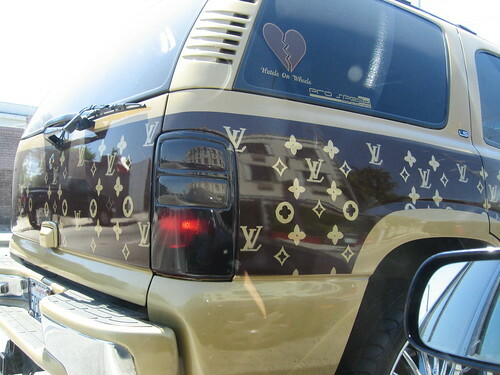 Because Louis Vuitton never made SUVs. And the deeper the right people look into your true, solidÂ paint, the more they appreciate the little specs that make up your solid color. It’s a lot cleaner and done better than a paint job with gold LV monograms bleeding into the brown -Â which actually gets uglier and less refined the deeper people look. You won’t be able to back it up. Sure, we all like to take shortcuts, use soundbites and affiliate with the already-recognizeable. But that’s not forward-thinking; that’s just following the status quo and quite frankly, not doing yourself a lot of justice. You’re just going to fall behind. This entry was posted in Humor, L.A., Thoughts, Web. Bookmark the permalink.